Realism was an artistic movement that began in France in the 1850s, after the 1848 Revolution. Realists rejected Romanticism, which had dominated French literature and art since the late 18th century. Realism revolted against the exotic subject matter and exaggerated emotionalism and drama of the Romantic movement. Instead it sought to portray real and typical contemporary people and situations with truth and accuracy, and not avoiding unpleasant or sordid aspects of life. Realist works depicted people of all classes in situations that arise in ordinary life, and often reflected the changes brought by the Industrial and Commercial Revolutions. The popularity of such 'realistic' works grew with the introduction of photography — a new visual source that created a desire for people to produce representations which look objectively real. As an art movement Realism was a reaction in the mid-19th century against what was seen as the artificiality of Romanticism, led by Courbet in France. It spread across Europe and was influential for the rest of the century and beyond, but as it became adopted into the mainstream of painting it becomes less common and useful as a term to define artistic style. After the arrival of Impressionism and later movements which downgraded the importance of precise illusionistic brushwork it often came to refer simply to the use of a more traditional and tighter painting style. It has been used for a number of later movements and trends in art, some involving careful illusionistic representation, such as Photorealism, and others the depiction of "realist" subject matter in a social sense, or attempts at both. Bonjour, Monsieur Courbet, 1854. 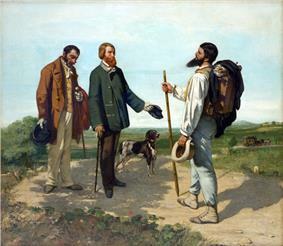 A Realist painting by Gustave Courbet. The Realist movement began in the mid-19th century as a reaction to Romanticism and History painting. In favor of depictions of 'real' life, the Realist painters used common laborers, and ordinary people in ordinary surroundings engaged in real activities as subjects for their works. Its chief exponents were Gustave Courbet, Jean-François Millet, Honoré Daumier, and Jean-Baptiste-Camille Corot. Realists used unprettified detail depicting the existence of ordinary contemporary life, coinciding in the contemporaneous naturalist literature of Émile Zola, Honoré de Balzac, and Gustave Flaubert. Courbet was the leading proponent of Realism and he challenged the popular history painting that was favored at the state-sponsored art academy. His groundbreaking paintings A Burial at Ornans and The Stonebreakers depicted ordinary people from his native region. The paintings were done on huge canvases that would typically be used for history paintings. Jean-François Millet, The Sower, 1850. Jean-François Millet, A Norman Milkmaid at Gréville, 1871. The French Realist movement had equivalents in all other Western countries, developing somewhat later. 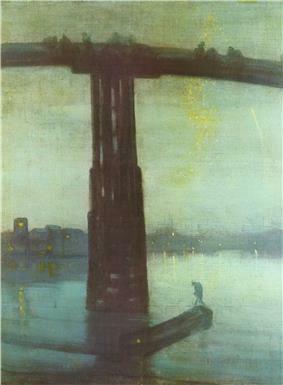 In particular the Robert Henri. It helped to define American realism in its tendency to depict the daily life of poorer members of society.